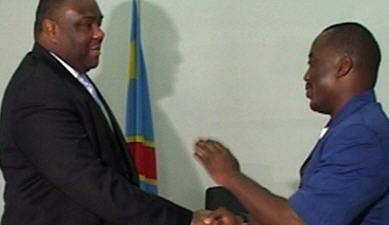 For the first time since the violent confrontations of last August, Joseph Kabila and Jean Pierre Bemba met twice in Kinshasa on Wednesday September 13 2006, at a meeting of the ‘espace presidential’ and also the Higher Council of Defense. The two presidential election candidates shook hands twice in front of the press cameras during the ‘espace presidential’ meeting of president Kabila and the four vice-presidents, although vice president Yerodia Abdulaye was not present. The atmosphere was relaxed and conciliatory, and the head to head meeting lasted some time into the evening. When they emerged, they declined to make any declarations to the press. The historic meeting took place shortly after Javier Solana, the EU high representative for foreign affairs, had suggested on Tuesday that the meeting could take place on Wednesday. This was following intense negotiations between Mr. Solana and two candidates. The bringing together of the two candidates, whose security forces faced off on the streets of Kinshasa between August 20 to 22 last, was assisted in no small way through the efforts of MONUC and the international community. Over the previous days, several international personalities arrived in Kinshasa to plead the cause of democracy and peace to Joseph Kabila and Jean Pierre Bemba, demonstrating the engagement of the international community in favour of dialogue and reconciliation in the DRC. The two men must now agree on measures to be taken to restore mutual confidence and to guarantee the respect of human rights for the election campaign of the second round of the presidential polls, envisaged for October 29 next.